I wanted to make just plain garlic knots when I saw a recipe over at serious eats. I loosely based this recipe on that.....by that I mean I kind of winged it after I looked at the pictures. I have made this since I filmed it and half of a pizza dough works better but this is only a two person serving. I really hope you give this one a try! I started out with enough dough for one pizza and let it rise in the refridgerator over night. The next day I diced up some pepperoni and threw it in a cast iron pan (I used an 8'' - original recipe called for a 10'') with the olive oil and butter. Simmer a bit and throw in the herbs and crushed red pepper, let that go for another minute or two and add the garlic. Cook another minute and remove from heat to cool - I added it to a metal bowl so that the garlic would not burn. 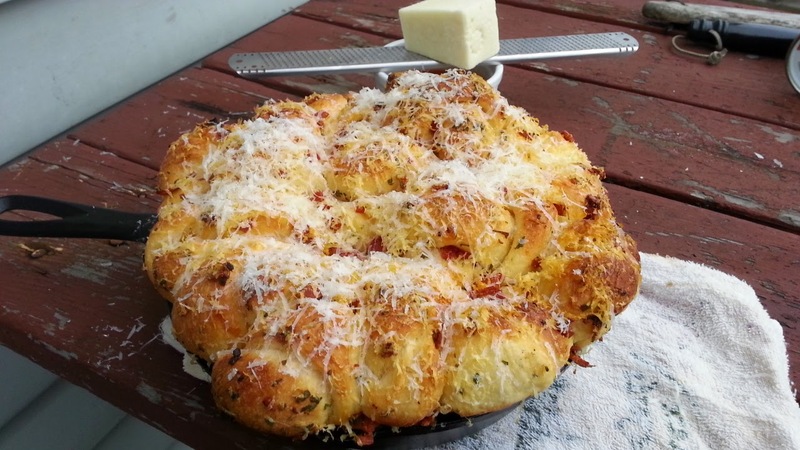 While the pepperoni oil is cooling go ahead and make the garlic knots. Roll out the dough to press out any bubbles and cut in strips. Tie strips in knots and toss in the pepperoni oil. Add knots back into the cast iron and pour over any oil/pepperoni left in the bowl. Top with freshly shredded cheese and cover. Let rise for at least 2 hours. I turned on the oven and when it reached 100 degrees, I turned it off and let the knots rise in there. These could surely be cooked in the oven but I prefer the smokiness a charcoal grill brings. After the knots double in size, preheat your grill/oven to 400 and cook for 20-25 minutes. 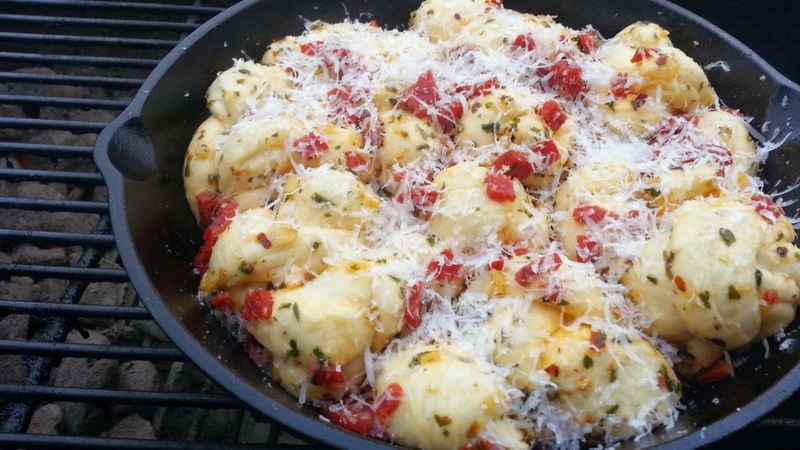 Add a some freshly grated cheese on top and serve with some warmed marinara sauce. If you plan on serving this to more than two people I highly recommend making a double batch. This sauce has everything... spiciness, sweetness, unique flavor and a nice tang! I came up with this idea from watching a Smoky Ribs rib video. The ribs looked so good I had to create an Candied Jalapeno BBQ sauce. Here is my attempt. It turned out really good and is excellent on pulled pork. As for the type of apples I used I am not really sure. I know it was 3 different types (Gala, Ida Red and Crispin I think), 3 firm and slightly tart apples would be ideal. 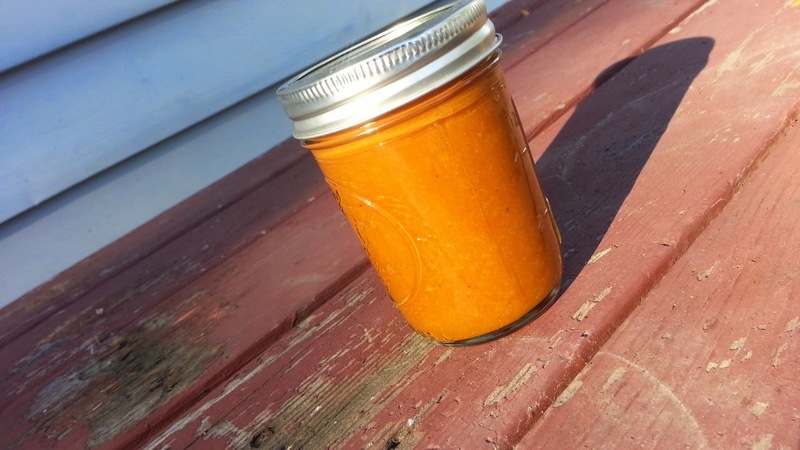 I hope you give this BBQ sauce a try! In a pot over medium heat add the oil, peppers and onions along with a big pinch of salt - cook until translucent. Add the apples and brown sugar and cook until the apples soften a bit. Add the candied jalapenos along with the brining liquid and all the other ingredients and bring to a simmer. Cook for an hour, adding water if it seems too think. Remember it will be much thicker after its blended and cooled. Let cool a bit and taste for seasoning - then blend. Place a towel over the top blender if the sauce is still hot. 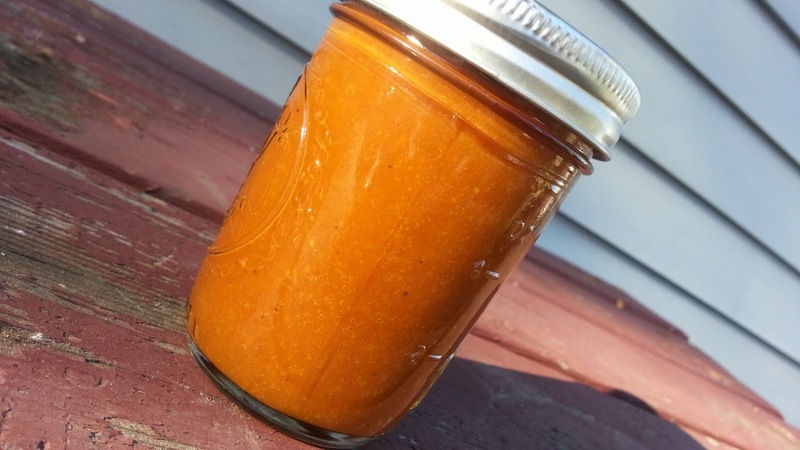 Pour into sterilized containers and store in the fridge or can the sauce. Sage and clementine zest really make this sausage! Super easy recipe to make the best sausage patties in your life! I hope you give these a try. Freshly ground sausage patties with no artificial ingredients like some of those store bought ones. Homemade sausage patties are perfect for anytime! This recipe is for about 3 lbs of pork shoulder. Mix all the spices and herbs together. Cube up the pork shoulder and mix in the seasoning mixture. Place the pork on a baking sheet and put in freezer for 20-30 minutes to firm up just a little. Feed the pork into a meat grinder, alternating fatty and not so fatty pieces. I used the small setting on the grinder. I recommend frying a couple patties up right away to taste for seasoning. They might taste a little under seasoned but - remember that the real test is after it sits in the fridge for 24 hours! The bonus recipe - A sausage sandwich cooked on the Kettle-Q. Bread toasted on one side with 2 fried eggs, 2 slices of 3 pepper jack cheese and 2 homemade sausage patties. This technique works in just about any temperature....it was snowing during most of the cook and 20 minutes later I had a perfectly cooked pizza. This produces a much better pizza than those made in the oven (even on a pizza stone). I hope you give this recipe a try. This technique has been tested many times on the 22.5 Weber Kettle grill but I am sure it will work on other sized kettle grills. Light 1 full chimney of charcoal - when ashed over dump charcoal in grill and bank on one side of the grill in a 'C' pattern. Leave lid off grill for about 5-10 minutes to let the charcoal light fully. When the briquettes are fully lit add some lump charcoal on top of the briquettes and place the grill grate in with a grill extension on top. Place the grill extension on the indirect side of the grill (not over the coals) Place lid on grill and wait about 15 minutes to come up to temp. I have reached 550-600 degrees Fahrenheit in the dome with this method. While grill is coming up to temperature, stretch the pizza dough and top with desired toppings. When the grill has reached place pizza on on grill extension and cook for 15 minutes. Check the pizza and rotate 90 degrees and cook 5 minutes longer. Times may differ because of ambient temperature/dome temperature, so play around with them. This is the technique that I have found to work perfectly every time.